Are viruses hiding within us? – Bio-Synthesis, Inc.
Home › Bioanalysis › Are viruses hiding within us? Recent research results indicate that viral sequences are part of us. Endogenous viral elements (EVEs) or endogenous retroviral elements (ERVs) have been identified in eukaryotic genomes including the human genome. The findings revealed the enormous scale of the invasion of vertebrate genomes by viral sequences. Weiss and Stoye report in a paper that was published in the Journal Science in May 2013 that retroviral genomes alone account for 6 to 14 % of the genomes analyzed to date, including approximately 8% of the human genome. Recent discoveries indicate that these endogenous retroviruses compromise more genomic DNA than that encoding the host proteome. Furthermore, the paper describes the potential consequences of the acquisition of ERVs. The following figure below illustrates this. It is thought that after the proviral DNA of a retrovirus integrates into the germ-line of a host it becomes inherited alongside all the host DNA sequences. The provirus may remain dormant or silent or may be expressed in the ways shown in the figure above (Source: Science 2013, vol 340 pp 820). BSI can help you to speed up your research. The consequences of the acquisition of ERVs may be neutral, detrimental, or beneficial depending on the nature of the acquired ERV and the position in which it was integrated into the genome. These findings are insights that originated from the human genome project that were made possible by recent advancements made in instrumentation, particularly in DNA sequencing technologies. Large-scale sequencing projects have allowed comparative genomics to reveal that endogenous retroviruses (ERVs) are common parts of eukaryotic genomes. However, the discovery that approximately eight percent of the human genetic material comes from a Virus was a surprise. Mobile elements where initially discovered in 1956 by Barbara McClintock. DNA-transposons amplify without RNA intermediates, whereas retroelements rely on an RNA transcript that is retrotranscribed by a reverse transcriptase before integrating into a genome. Retroviruses (RVs), such as the HIV virus, are RNA viruses that can replicate in a host cell. The replication occurs by reverse transcription in which the virus uses it own reverse transciptase, an enzyme that can make DNA from RNA, to produce DNA from its RNA genome. Reverse refers to the fact that RNA is back translated or transcript into DNA. Next, the new DNA is incorporated into the host’s genome by the enzyme integrase. The so integrated DNA is now treated by the cell as it’s on DNA or self DNA. This piece of DNA can now code for the parts needed to make the virus particles including the proteins needed for the assembly of the virus particle. The retroviruses are enveloped viruses that belong to the viral family Retroviridae. Endogenous retroviruses are special variants that are integrated into the genome of the host and are therefore inherited across generations. Note that the term “ENDOGENOUS” can refer to a substance or factor that is produced or synthesized within an organism or system such as a hormone. The data indicated that repeated integration of new viral sequences of ERVs into their host’s germline allows them to proliferate. These integrations can become fixed in the host population. The result is that ERV sequences or sequence loci now comprise 8 to 10% of the human and mouse genomes. These sequences also includes nonautonomous LTR-retrotransposons, also known as class I transposable elements. They consist of two sub-types, the long terminal repeat (LTR) and the non-LTR retrotransposons. ERVs form phylogenetically distinct lineages traditionally called “families”, each of which is thought to be the result of the expansion of a founder infection of the organism’s germline that may have occurred more than approximately 100 million years ago. The majority of these proviral remnants of previous retroviral infections appear to have been inactivated due to mutations accumulated over time, however, current research suggests that members of at least one family of human retroelements may still be capable of movement. More recently scientists have found that non-retroviral viruses called bornaviruses have been endogenized repeatedly in mammals throughout evolution. Bornavirus (BDV) owes its name to the town of Borna, Germany. In the year 1885 a virus wiped out a regiment of cavalry horses. BDV can infect a range of birds and mammals, including humans. This virus is unique because it infects only neurons and can establish a persistent infection in its host’s brain. Furthermore, the entire life cycle of the virus takes place in the nucleus of the infected cells. Many endogenous Borna-like N (EBLN) elements in many diverse mammals have been identified in recent years. ERVs are considered to be a combination of pathogen and selfish genetic elements. Some ERV lineages proliferate by infecting germline cells, as do typical retroviruses, whereas others lack the env gene required for virions to enter cells and thus behave like retrotransposons. Magiorkinis et al. analyzed ERV loci recovered from 38 mammal genomes by in silico screening. Modeling the relationship between proliferation and replication mechanism in detail within one group, the intracisternal A-type particles (IAPs), and performing simple correlations across all ERV lineages, the researchers could show that when ERVs lose the env gene their proliferation within that genome is boosted by a factor of ∼30. Next, borrowing simple epidemiological and ecological models allowed the scientists to show that retrotransposition and loss of env is the trait that leads endogenous retroviruses to becoming genomic superspreaders that take over a significant proportion of their host’s genome. Apparently approximately half of the mammalian genome is derived from ancient transposable elements. There are two general types called (DNA)-transposons and retroelements. A more detailed classification is shown in the next figure. The majority of intragenic or near-gene insertions of retroelements appear to have been not favorable for the host and may have been either not fixed in the population or were removed from the linage in the long term. The next table shows a list of more recent insertional mutagenesis events that lead to alleles associated with diseases in humans. FGFR1, fibroblast growth hormone receptor 1, chromosomal translocation; AZFa, azoospermia factor a, nonallelic homologous recombination between HERVs; APC, adenomatous polyposis carcinoma. *Somatic insertion. 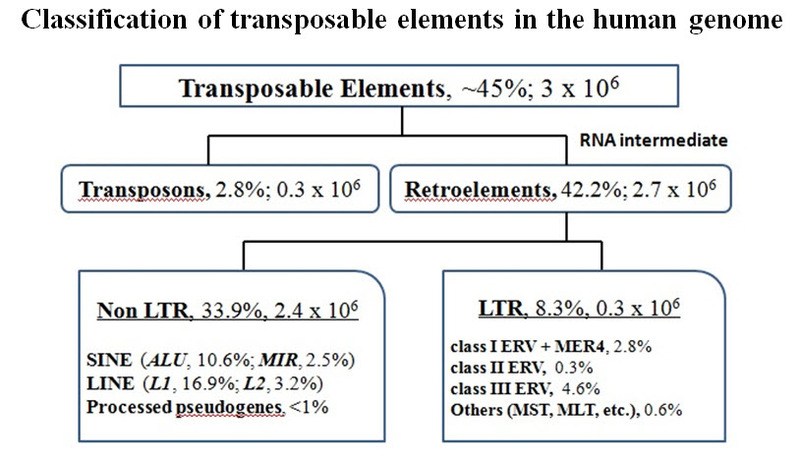 The following table shows documented cases in which retroviral sequences have been assimilated for promoter or enhancer functions. The expression of HERV sequences is suspected to cause or promote some types of cancers, however, it is also thought that they might help to regress tumors by serving as tumor-specific antigens. It has been reported that endogenous retroviral genes can code for peptides that are recognized by tumor-specific CTLs as well, at least in mice. These encoded peptides appear to be expressed in most melanomas. These peptides may serve useful for the development of therapeutic vaccines. Norbert Bannert and Reinhard Kurth; Retroelements and the human genome: New perspectives on an old relation. PNAS 2004 101 (Suppl 2) 14572-14579; published ahead of print August 13, 2004, doi:10.1073/pnas.0404838101. Gkikas Magiorkinis, Robert J. Gifford, Aris Katzourakis, Joris De Ranter, and Robert Belshaw; Env-less endogenous retroviruses are genomic superspreaders. PNAS May 8, 2012 vol. 109 no. 19 7385-7390. Stoye JP. Endogenous retroviruses: still active after all these years? Curr Biol. 2001 Nov 13;11(22):R914-6. Robin A. Weiss, Jonathan P. Stoye; Our Viral Inheritance. Science 17 May 2013: Vol. 340 no. 6134 pp. 820-821 DOI: 10.1126/science.1235148. Perspective Virology. E-mail: rweiss@ucl.ac.uk; jstoye@nimr.mrc.ac.uk. ‹ Which solid phase polypeptide synthesis do you like better? Fmoc- or tBoc-chemistry based? Hello there, You’ve done a fantastic job. I’ll certainly digg it and for my part suggest to my friends.